A one year old child is now hale and hearty with a mother who had a long struggle to bear the child. This birth is a miracle because Mrs Bhatia has undergone over 15 cycles of IVF birth, and unfortunately they were all failed attempts. However, luck favoured her after she gave birth over the failed attempts. Even the scientists are reported to have clearly stated the fact that it is difficult to bear a child after 10 such IVF attempts. Mrs. Bhatia’s dream of motherhood got realized in India in the Gaudium IVF Centre. Throughout these 15 IVF cycles which brought only depression, Mr. & Mrs. Bhatia collectively spent lacs of rupees and almost 500 days of life. PCOD with blocked tubal function led them to suffer the pain of infertility for almost 15 years. The couple spent 15 years for discovering the hope of having a child through natural cycle and medicinal prescription but to no results. Mr. & Mrs. Bhatia travelled from one IVF center to another, from India to abroad before they made their last attempt with Gaudium IVF Center at New Delhi. The highly skilled experts at Gaudium IVF Center analyzed the case in detail and a case of Recurrent Implantation Failure (RIF) was determined. It was examined that embryos of good quality were failing to implant in the IVF cycles. Along with the causative factors of RIF, the case was complicated due to existing medical condition of the mother as she was a diabetic and hypertensive patient. The team of experts under the guidance of ace IVF specialist Dr. Manika Khanna, Director, Gaudium IVF, IVF clinic chains India, handled the case with balanced protocols to deal both the RIF factors and medical condition of the patient so as to lead a successful IVF cycle. 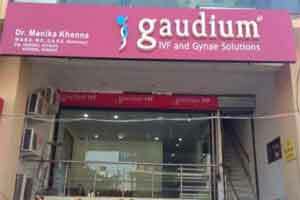 The customized IVF protocols were developed for the patient which handled the unreceptive endometrium with the latest technology at Gaudium IVF Center. The personalized treatment and IVF therapy led to the successful IVF cycle as Mrs. Bhatia conceived the child who is one-year-old now. This being the first case in medical history in India press for the debate to rationalizing the IVF treatment as every patient case should be analyzed and treated with customized and scientific approach. Experts have been negotiating the need of developing a case-to-case treatment protocols rather than applying general IVF treatments on every patient. The approach not only leads to the failure of IVF cycles but also leads to the depression and lost of hope amongst couples.